I don't know how I forgot to post these. 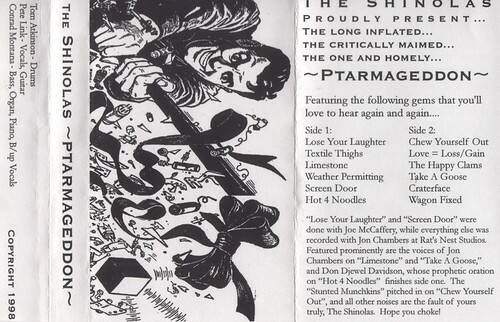 Not one, but two more tapes from the ultrafantastic Shinolas! These guys were fantastic, sloppy, fun power pop. Plus, this tape sees two of my local faves contributing: Joe McCaffery (again!) and Djewel Davidson. Speaking of whom, I saw Djewel in the library last week. How uncool is that?